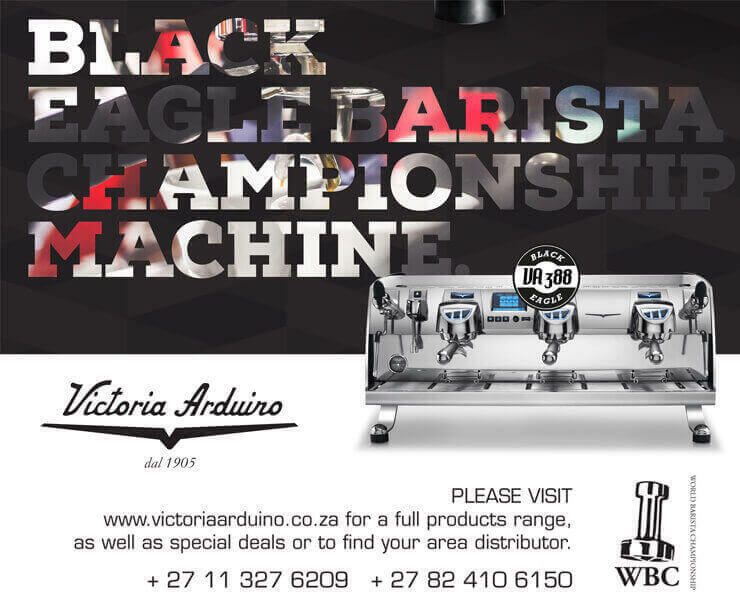 A little bit of African Spirit in your daily coffee fix! Local packaging company Detpak have launched these incredible take-away coffee cup designs, all inspired by local school children. 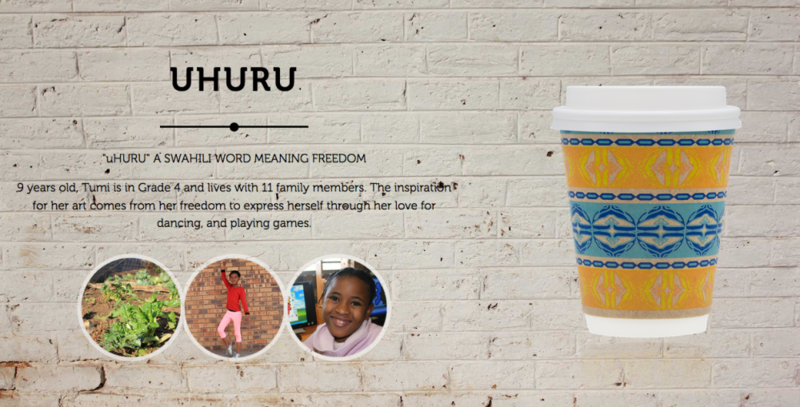 Each cup design was developed after visiting children at the uMbuyisa Children School of Arts and Culture, where they painted their representation of Africa day, Youth day and Mandela Day. The designs are named after significant symbolic words. 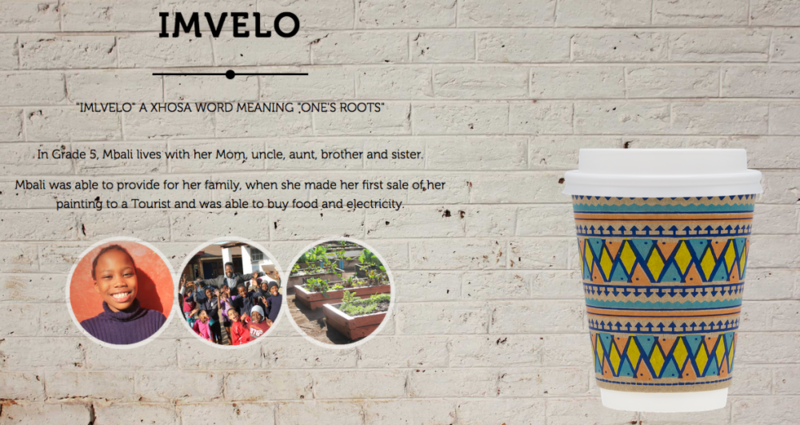 "IMLVELO" A XHOSA WORD MEANING "ONE'S ROOTS"
In Grade 5, Mbali lives with her Mom, uncle, aunt, brother and sister. Mbali was able to provide for her family, when she made her first sale of her painting to a Tourist and was able to buy food and electricity. 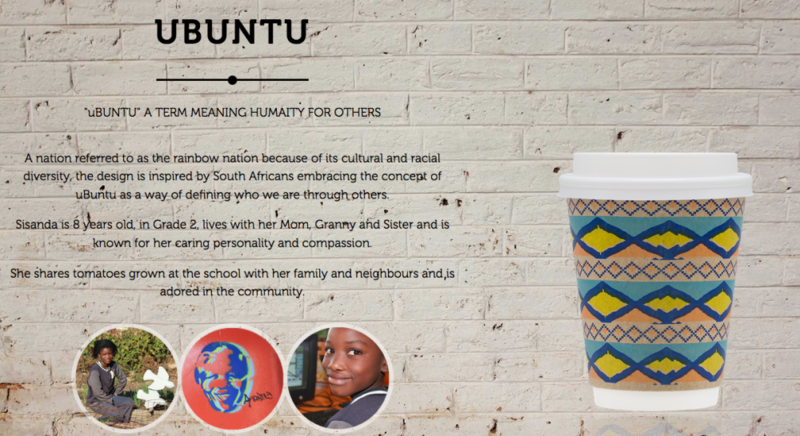 A nation referred to as the rainbow nation because of its cultural and racial diversity, the design is inspired by South Africans embracing the concept of uBuntu as a way of defining who we are through others. Sisanda is 8 years old, in Grade 2, lives with her Mom, Granny and Sister and is known for her caring personality and compassion. She shares tomatoes grown at the school with her family and neighbours and is adored in the community. 9 years old, Tumi is in Grade 4 and lives with 11 family members. The inspiration for her art comes from her freedom to express herself through her love for dancing, and playing games. uMbuyisa is a registered non-profit organisation run by Tshepo Ramutumbu, situated in Orlando West Soweto. They provide children aged 6-18 a safe environment to do homework, learn computer skills, painting and gardening. The school was initiated in 2002, with an aim to uplift the community and currently is responsible for 60 kids. The school is sometimes visited by tourists as it is located in Vilakazi street, one the tourist attractions in Soweto. As a previous community project Detpak donated computers with an installed art program and plans to continue doing more for the School. Detpak is a speciality converter of paper packaging providing a full range of products focused on the food service markets. In line with global standards, it is situated in Aeroton, Johannesburg South, with most of its employees living in the Soweto area. With a total 244 employees, Detpak aims to play an active role in its community and in that of its employees. Detpak's previous projects include donating paint, paint brushes, and crops for the school garden. By choosing these cups, you support Detpak's initiative to donate a portion of the sales back to the school to continue making a difference. While comprising of 95% board from renewable sources, paper cups are lined with a thin coating of polytheylene (PE) on the inside of the hot cup. This lining is required for the cup functionality however renders cups unrecyclable in standard recycling facilities and have resulted in used cups being routed to general landfill. As a cup manufacturer, Detpak holds its social responsibility in high regard and have highlighted the plight of these cups to Mpact Ltd, our majority shareholder, who has a large footprint in the recycling sector. Mpact has built a Liquid Packaging plant in Ekurhuleni, Gauteng in July 2017, capable of recycling up to 25 000 tons of cups and Tetrapack products. This enables cups to be rerouted from landfill to continue in the paper value chain as secondary packaging or paper cores.